Here is one of several pieces going to auction this Saturday, June 4th, 2011. 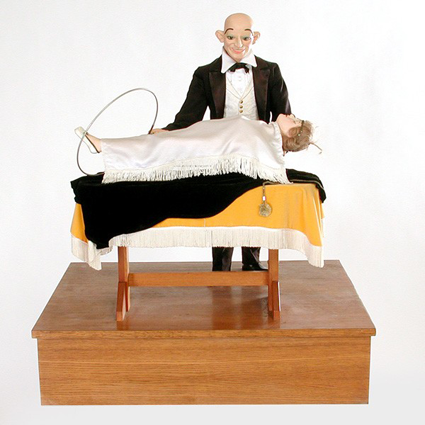 This piece depicting a magician levitating a woman was manufactured by Decamps around 1920. The figure has painted composition hands and head and multiple movements. To get a sense of scale, the magician figure stands 28 1/2" tall, so it is fairly large. It's estimated worth is between $4,000 - $6,000 USD. Here is where you can get more details on this and several other French automata going to auction.